As our family continues to grow in love and joy with our little distemper survivor, QT, we are still haunted at times by the loss of his littermates who could not be saved. 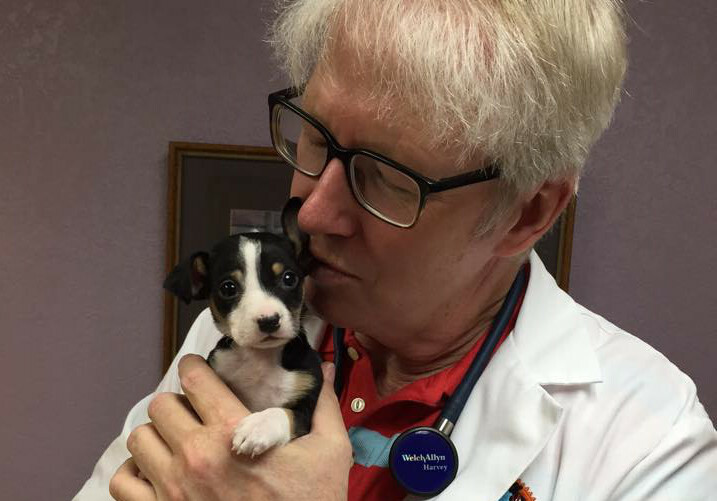 I first met Salvatore, a tiny puppy brought to me from Panhandle Animal Shelter, at North Idaho Animal Hospital. I thought he had aspiration pneumonia and antibiotics would turn him around. I was wrong. He was the first case of distemper to strike the shelter since it brought in a large number of dogs and puppies from a shelter in California. My wife and I said we’d pay to send Salvatore to the teaching hospital at Washington State University, where I went to veterinary school, but he did not survive long enough to reach the hospital. When his brothers came in with the same symptoms, we immediately made the same offer for them. One, Sebastian, didn’t make it. One, Sam, did, and we adopted him and re-named him QT. Panhandle struggled with many cases of distemper due to that outbreak, but by working with the shelter medicine program at the University of Wisconsin-Madison School of Veterinary Medicine were able to save nearly all the stricken dogs. Sunday is National Pet Memorial Day, and I want to offer up my prayers and thoughts for the many animals who have lost their lives this year, but above all for Salvatore and Sebastian and the homeless pets who have never even had the chance those little ones did to survive and become a beloved pet.